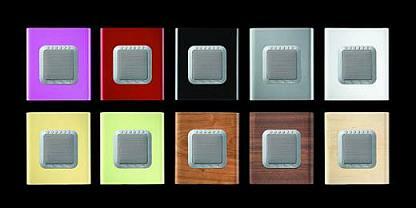 This cute and curvy audio device is better known as the Cubo from Sonoro. Apparently it’s a combination of “acoustic excellence and sleek design” delivering an “unrivalled clarity of sound” with its CD player, DAB and FM radio offerings. When you’ve had enough of the radio or you’re sick of listening to the same albums, there’s also audio input for your iPod or MP3 player. There are ten tints to choose from. I won’t name them, instead you can check out the rainbow coloured offerings after the jump. Cubo has a full range speaker integrated with a bass-reflex tube designed to provide you with a natural acoustic sound with whatever format you’re bopping your head to. 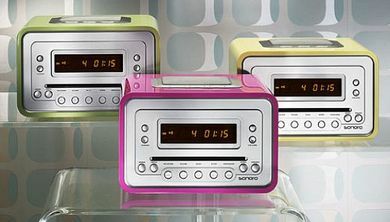 Sonoro also understands you may very well stay up all night listening to your favourite tunes and might have trouble getting yourself out of bed in the mornings, so they’ve thrown in an alarm clock too with that all important snooze button. The Cubo’s amber backlit display is dimmable when using the alarm clock function, so a horrible gleaming glare shouldn’t deny you your slumber. Pick one up in the colour of your choice from Harrods or Selfridges for £269.